Sara shows Safa’ a brush technique during art therapy at CRP. 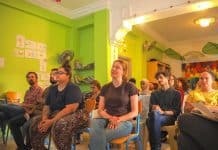 When Sara, a Jordanian architect based in Amman and London, began the art therapy program about a year ago, she wanted it to be totally apolitical. 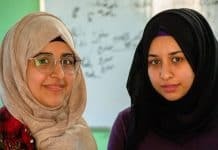 When the women began talking about the trauma they had faced in Iraq, Syria, and Sudan, she told them to focus on the art instead. “But they told me, ‘Sara, we feel safe here to talk about these things,’” she says. It has become an informal atmosphere to help each other and work through the pain that they carry. Of course, there are a lot of jokes and laughter too. 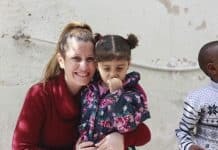 As the women have gotten to know each other, they have become fast friends, though they may come from different places and follow different religions. 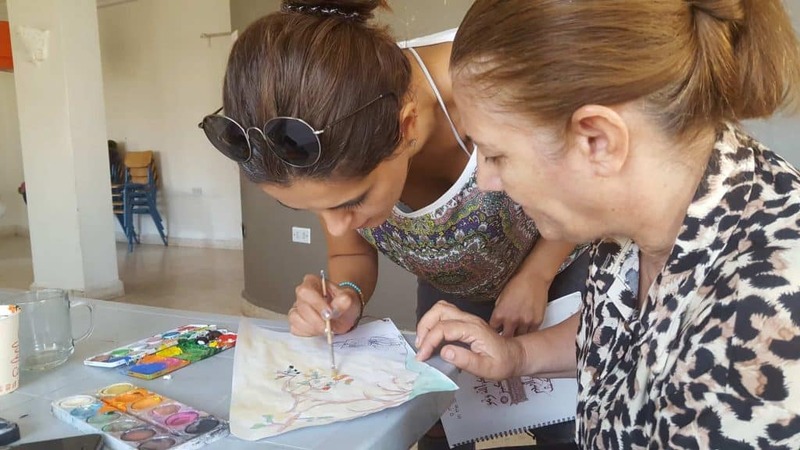 Often Sara demonstrates drawing for the group and they copy her work. At other times, they copy famous works out of books, like Van Gogh’s self portraits. But sometimes the women ask for something specific. Recently Safa’ asked to draw a tree, so that she could go home and try to crochet the same scene. Shatha, another beneficiary, recently asked for a large blank piece of paper. When she was done at the end of the hour, she proudly held it up for the group and then taped it to the wall. “I love the sea,” Shatha explains, displaying her painting. Lamia’s favorite activity is to paint glass. During a session earlier this month, they spent the class painting glass bottles that they had found. They painted motifs of peacock feathers, upcycling the bottles into vases. They do this activity often and many of the women whole collections of the art at home. Lamia’s favorite activity is painting glass. Here she shows off one of her recent creations. 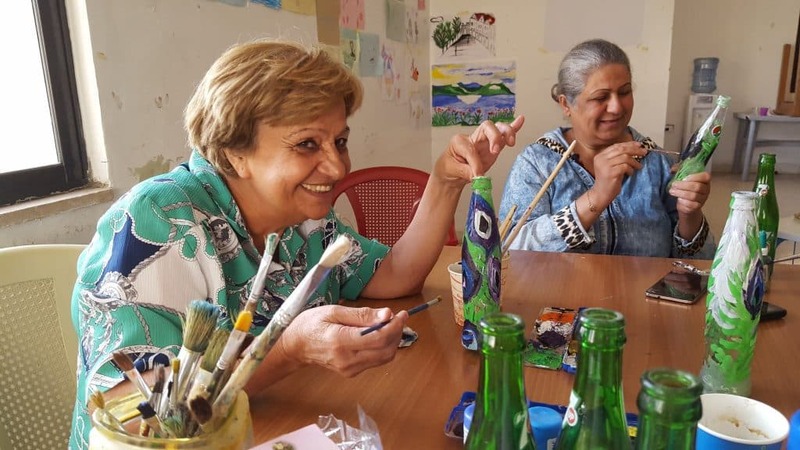 Many of CRP’s activities are designed to have a relaxing atmosphere so that our beneficiaries are able to work on the stress of relocating to a new country and build community. 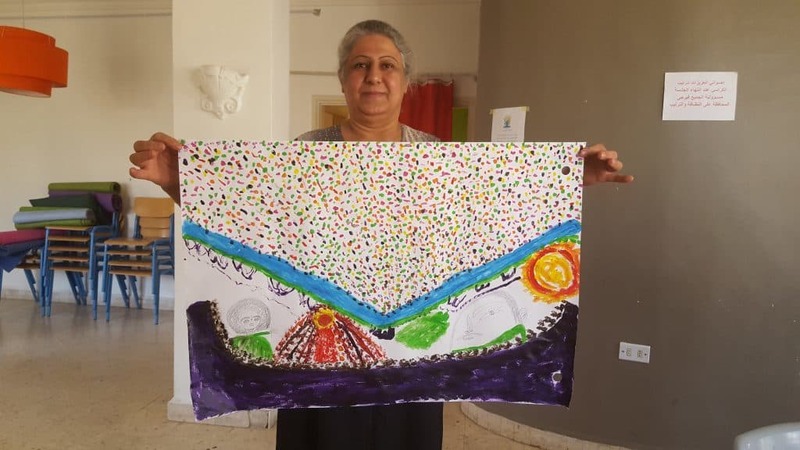 This goes to show that art is a great tool for all ages, and no matter anyone’s skill level, its therapeutic aspects are important. Previous articleGoodbye & Good Luck, Abu Ahmed!